Maybe it’s just the holiday season. 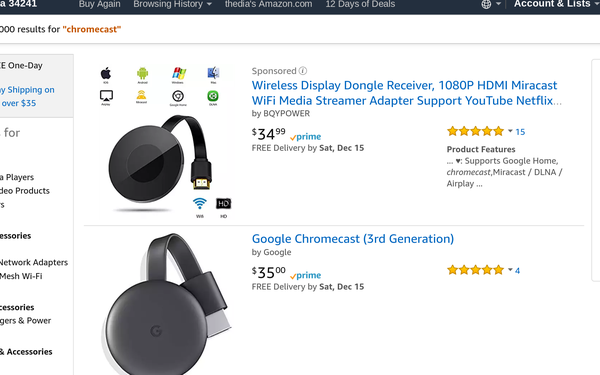 Neither Amazon nor Google are talking about it -- but all of a sudden, consumers can now buy a Google Chromecast streaming device from the Amazon shopping site again. That hasn’t been possible since 2015. Lately, the Amazon site told customers the dongle was out of stock, a condition that lasted until Wednesday night, when the website Android Police alerted readers that it was once again available. Back when Chromecast left the Amazon marketplace, Amazon said it was to “avoid customer confusion” because the Chromecast device didn’t support Amazon’s Prime Video service. But it was also true that Chromecast competes with Amazon’s Fire TV streaming device. On the flip side, and possibly to retaliate, Google last year pulled YouTube and YouTube TV from Amazon products, including Chromecast and the Echo Show assistant. Since YouTube is about as ubiquitous an app as there is, that kind of hurts. YouTube is still a no-show. Amazon also yanked Apple TV streaming device from its site until last year, when Apple added a Prime Video app. That might mean something. Based on that, the goodwill-toward-men tech segment might suppose Amazon’s decision to restock Chromecast represents a detente moment. But neither company is commenting -- which for both, is consistent with their tight-lipped style.